Cardinale in THE PINK PANTHER. Claudia Cardinale was born on April 15th, 1938, in Tunis, Tunisia. She came to public attention as a beauty queen in Italy. In 1963, Claudia Cardinale played Princess Dala in THE PINK PANTHER. 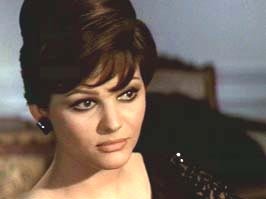 Then in 1993, Cardinale was in SON OF THE PINK PANTHER as Maria Gambrelli. In the same year, Cardinale played a young bride bringing new blood to an old aristocratic family, in Luccio Visconti's THE LEOPARD. Burt Lancaster co-starred with her as the Italian paterfamilias, leading his family into modern times. In the same year, Claudia Cardinale also starred, with Marcello Mastroianni, in Federico Fellini's autobiographical film, 8 1/2. She played Claudia, the love interest of a married, middle-aged film director, who has already burned through a plethora of loves. In 1968, Claudia Cardinale played a beautiful widow in distress, in Sergio Leone's ONCE UPON A TIME IN THE WEST, with Henry Fonda and Jason Robards. In Werner Herzog's 1982 film, FITZCARRALDO, Cardinale played Molly, the mad title character's love interest and financier for his Ship of Dreams to be transported overland through the South American jungle. Claudia Cardinale in THE PINK PANTHER (1963).